I just want to share these shopping tips because I’m a big fan of Amazon.com. Even though I live in the Philippines, Amazon is still the best online market for me. That’s right, I’m shopping across countries, but it’s a lot easier now given there are so many ways to ship Amazon products to Philippines. 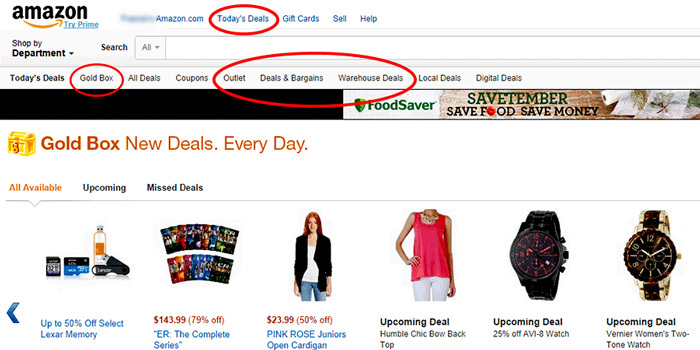 Amazon’s Friday sale has ended, but since there are too many deals everyday, you won’t be needing it anymore. Make yourself aware of Amazon’s Gold Box Deals. On the website, just find the link on top that says “Today’s Deals” and you can have access to all the Amazon bargains waiting to be purchased by you. I also recommend checking out Outlet Store and Warehouse Deals – wherein they showcase items that are overstocked, used, refurbished or slightly damaged with huge discounts. If you’re a frequent Amazon shopper, consider getting an Amazon Prime membership. You will get free and fast shipping on all Prime Items, and you can also get free access to Amazon’s vast video and music library. For just $99 annually, this can help you save a lot of money. If you love reading books, Amazon lets you download books for free. Just type “Kindle books free” on Amazon’s search box and you’ll see all those books with a $0.00 price. You don’t actually need a Kindle device to read them, just download and install the Kindle app to your computer. The app is also available for mobile devices running Windows, iOS, Android and Blackberry OS. Don’t miss out on the deals happening every Black Friday and Cyber Monday, which is very popular in the US. This year on Amazon, the promo started very early last November 20 and it will end on November 30. Enjoy the discounts and price drops on various products such as electronics, clothing, games, movies and more! This last tip is probably the most important thing when shopping online. When buying an expensive product, be sure to do your research first. The product ratings and reviews posted by other customers can really help but also feel free to find more information on external websites and do a price comparison with other online stores. Though Amazon always assures you with the best price, sometimes price hikes will happen due to low number of stocks. The last thing you may want to check into is the seller. Though most items are fulfilled by Amazon, there are instances that the product is shipped and sold by third party sellers. By clicking on the link with the merchant’s name, you will find out a few description about them together with their Amazon rating and feedbacks from past customers. About the Author: Nehemiah Mendez is a web developer from the Philippines. He manages his own blog website and he loves to write articles about technology. His website – Tech-PH.com aims to provide reliable source of information to people and someday become one of the Best Philippine Blog Site.